Cupcakes and muffins are popular food items to sell at school bake sales. The only problem is transporting these delicious foods to the sale without harm. Clear cupcake boxes with inserts are the perfect solution for preventing cupcakes or muffins from being ruined after sliding around in the container. It is also an excellent way to box cupcakes and muffins for buyers to take home with them. 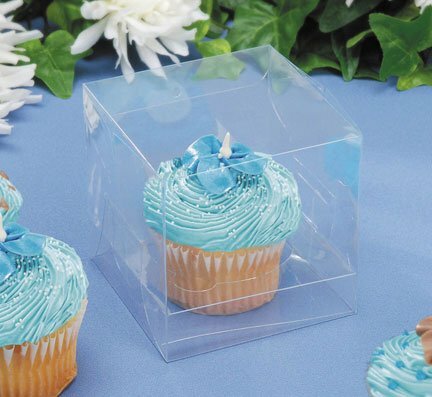 Clear cupcake boxes can be used for one or more cupcakes to take for lunch or give as gifts or party favors. Lightweight cupcake boxes look similar to donut boxes. They are available in many sizes to hold from one to a dozen cupcakes. Most boxes use holders that fit inside the box with recessed spaces to keep cupcakes in place. The many colors and designs provide an interesting and enticing presentation of these delectable edibles. Some boxes incorporating a transparent section of the lid are called window boxes. This see-through section can be round, square, rectangle, or heart shaped. A waterfall window is the cellophane window on the lid which cascades over the edge to the front of the box. These affordable boxes are used by bakeries, grocery stores, and caterers. Moms who bake for sales and fundraisers find them extremely helpful for transporting the final food product to the proper destination without harm. Clear cupcake boxes are made from clear acetate or polyethylene terephthalate (PEY) which is acid free and will not harm the food if it comes in contact. These boxes are transparent all the way around and available in various sizes depending on the number of cupcakes to hold. Boxes that hold a single cupcake are an excellent way to take one cupcake to work, school, camping, or picnics. Placing a decorative bow or ribbon on the box turns it into an elegant gift for a special birthday, party, or other occasion. They are also great party favors for engagement parties, bridal showers, and baby showers. Sizes vary from 3”x3”x3” for one cupcake to larger sizes accommodating up to one dozen cupcakes. Cupcake boxes can be purchased in bulk for as little as $3 per box. Clear cupcake boxes start at $10 per box. Both can be conveniently stored flat until needed. Those in the baking business and women who bake at home find these useful items just what they need to preserve their edible creations for others to enjoy.